Best data manager to transfer video, music, TV show, movie and photo between iPhone and Mac. It allows you import/export data at fast speed with zero quality loss. You can also use iPhone as USB drive for file backup. Work as iTunes alternative. 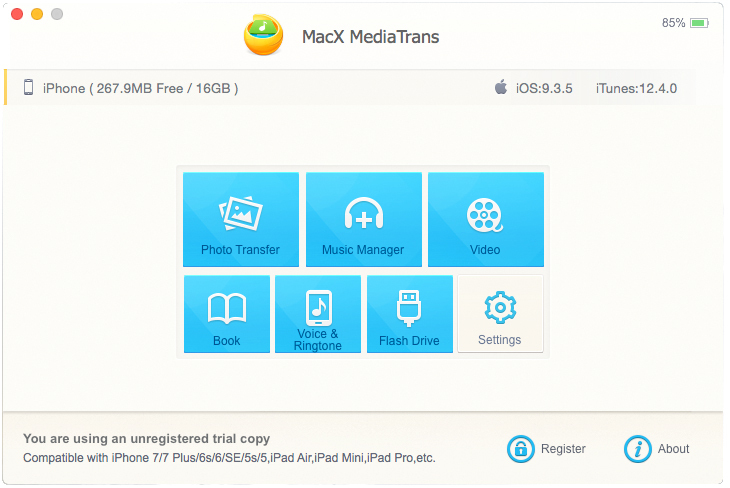 MacX MediaTrans is the best solution to transfer& backup data between iPhone iPad iPod and Mac. It not only manages and organizes the file on your device, like video, music, photo, movie, TV show, but also supports backing up PDF, APP, dmg to iPhone by using it as USB drive. This Mac file manager also empowers you to create/delete/edit playlists, and to manage music tracks, albums≥nres in batch like a breeze. In addition,this iPhone transfer can auto rotate sideways videos and convert AVI, WMV, MKV, etc. to Mp4 to fit iPhone iPad with high quality preserved. On top of this, MacX MediaTrans has NO.1 fast speed. With cutting-edge tech, this iPhone manager is able to transfer data at a speed of 20 Megabits per second, so even 100 4k photos can be transferred in 8 seconds!Working as iTunes alternative, MacX MediaTrans is the fastest data transfer to backup your iPhone iPad files, free up more storage space before updating to new iOS or change to a new iPhone. No more erasing original data, complicated operation, awkward one-way sync process or strict format limitation.Main Features:1. Directly transfer music from iPhone to Mac and vice versa as you wish.2. Freely transfer video, HD movie, TV show and home video to iPad iPhone from Mac or Mac to iDevice.3. Export& import photo on iPhone to Mac in batch, without iCloud limits.4. Backup iPhone data by using iPhone as USB drive, like PDF, APP, dmg, etc.5. Backup files at world’s fastest transferring speed, without quality loss or data loss.6. Auto convert AVI, FLV, MKV, etc. to Apple compatible video formats.7. Two sync process is available.8. Auto rotate sideways videos frame by frame for better watching experience on iPhone.9. Ability to create/delete/edit playlists without iTunes limits and batch manage tracks, albums& genres.10. Reduce big video file size to 50% on iPhone iPad.11. Let you beam photos/videos/music to your device by drag&drop.